As part of an event hosted by both Asda Shipley and Asda Keighley we have donated a couple of prizes. The event is in aid of the 'Bradford Burns Unit' which was set up following the disastrous events at Valley Parade back in 1985 which took the lives of 56 people. 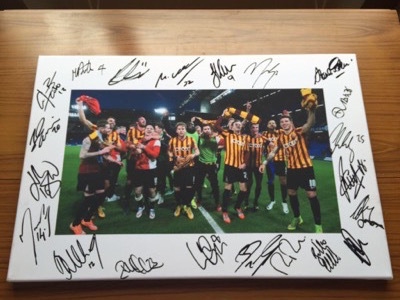 As part of the auction we have donated an A2 canvas of the Bradford City FC squad celebrating the famous 4-2 win over Chelsea FC in the F.A. Cup 4th round at Stamford Bridge which has been signed by the squad themselves! We will also be donating a Selfie Stick as one of the raffle prizes. The event itself is a Charity football event held on May 17th at Bolton Woods Football Club, where there will be a football tournament between some of the Asda stores, as well as face painting, bouncy castles and a Beat the Bunny penalty shootout for all of the kids! Entry to the event is just £1 for adults and donations for kids so if you're in the area get yourself down to support a great cause on what will be a cracking day! In order to bid on the signed canvas all you need to do is go to https://www.facebook.com/groups/2208709274/, join the group and click on the pinned post to make a bid, alternatively you can enter a bid by sending an email to Tommy-Dunne@live.co.uk. As we've mentioned before the event is for a great cause so if you can make the event or would be interested in any of the prizes please do get involved.